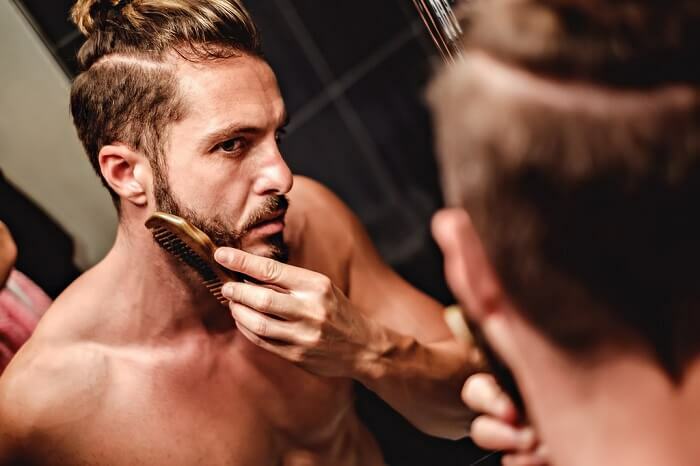 Learning how to shape your beard at-home can save you time and money in the long-run. However, proper beard grooming is a skill that requires patience, precision, and practice. The most challenging part for most men is learning how to line up your beard correctly. Follow these steps to achieve clean, well-defined edges like a professional. Prepare for trimming by shampooing and conditioning your beard beforehand. Choose products that are designed for your hair’s natural texture for the best results. A good washing will remove any excess oils and dirt that can dull your beard trimmer and even clog it. Before moving on to learning how to line up your beard, make sure your hair is completely dry. Cutting wet hair can result in an uneven edge and excess stray hairs. Air drying is best, but you may use a blow dryer if you are in a pinch. If you do, make sure to keep it on a low heat setting. Use the blow dryer at least 12 inches away from your face to prevent irritating your skin. To properly learn how to line up your beard, you will need the right tools. Don’t skimp out on investing in quality products. A reliable beard trimmer with multiple guard sizes is critical for achieving a barbershop quality look in the comfort of your own home. You will also need hair cutting scissors for trimming away scraggly hairs. A beard comb is also necessary for this process. A barber pencil or light-colored eyeliner can also be useful for creating a guideline to follow while trimming. Once you are done lining up your beard, you can polish your look with products such as beard oil or beard balm which also add shine and fullness. Lay out your guard sizes and other tools so they are easy to reach in a well-lit room with a large mirror. For detailing your sideburns and neckline, a self-standing magnifying mirror can come in handy. Use a wide-toothed beard comb to remove any tangles. Make sure you comb your hairs in the direction that they naturally grow. Do not attempt to situate them however you prefer them to rest. Doing so can result in uneven trimming and noticeable edges that do not blend properly. Start by defining a diagonal line with your barber pencil or eyeliner. The line should lead from the beginning of your sideburns near your ears to the top of your mustache. This should follow the natural line of your cheeks. Over time, you will be able to visualize this line and may skip using an aid such as eyeliner. Take your time to ensure the line is straight and even on both sides of your face to prevent an uneven edge. For the best results, skip using a guard on your trimmer for this step. Doing so will give you the cleanest look possible. Starting at the line you drew at the beginning of your sideburns, trim in a downward motion following the grains of your hair. Continue shaving along the line across your cheeks until you reach the mustache. Fully and delicately remove any hairs above the line you drew earlier on your cheeks. The skin here can be easily irritated. Carefully round off the edge where your beard meets your mustache for a natural look. This is an essential part of learning how to line up your beard. On the other hand, some men opt out of it for a sharp and angular look. Shaving the neckline can be difficult at first, so you may want to use a barber pencil or eyeliner to draw a guide. Find the midpoint of your beard by drawing a line one inch above your Adam’s Apple. Extend it outwards in a horizontal line. This will serve as the point in which your beard ends. Start by shaving downwards from your midpoint. Afterwards, work your way to the outer edges of your neckline where it meets your sideburns. You may use a guard to achieve your desired fade. The final step in learning how to line up your beard is to carefully trim stray and scraggly hairs. Comb through your beard several times while trimming to make sure all unwanted hairs are removed. Using quality scissors, snip away at stray hairs in a diagonal motion. 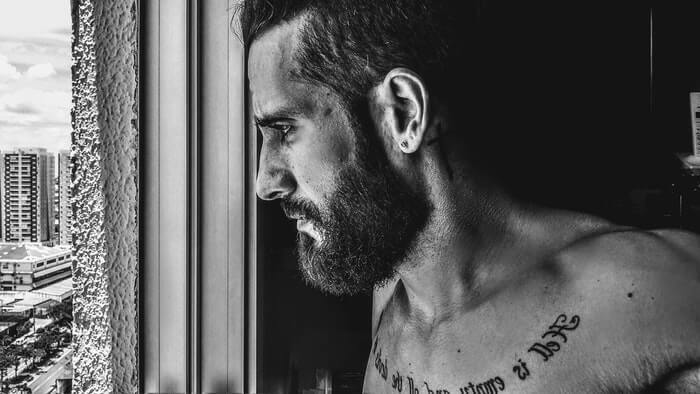 Cutting hairs dead-on can create unwanted edges or gaps in your beard. Once you’re satisfied with the shape of your beard, apply your favorite beard oil or beard balm to set the look. These products can also add shine and fullness to your hair. However, be careful not to use too much product. Doing so can make your beard greasy, stiff and may even irritate your skin. You may also apply facial moisturizer to replenish the skin after trimming and prevent redness. When it comes to how to line up your beard, aftercare is just as important as the initial trim. Touch-up your look once every couple of days to maintain clean lines. Regular trims save you time in the long run and keep you looking your best. Learning how to line up your beard gets easier with practice over time. Be patient while trimming and don’t forget to adjust your beard trimmer’s guard sizes as needed to get the best results possible. Ready to master how to line up your beard at-home? Try these steps today!